Denis Menchov?s grip on the Vuelta became a stranglehold on Monday as the Rabobank rider took a convincing victory at the summit finish of Arcalis. The race leader since Saturday, 24 hours later Menchov comfortably outsprinted a seven-man group of rivals containing all the favourites. There may be 11 stages left to race, but the 2007 Vuelta has certainly found its patron. 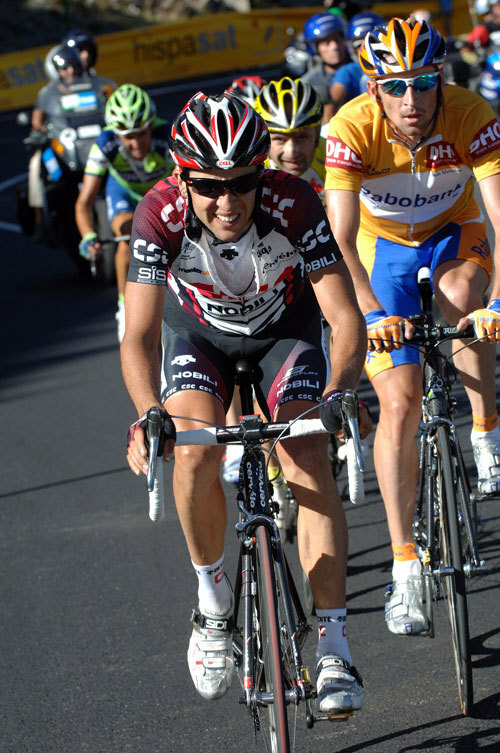 Try as his rivals might – and Carlos Sastre (CSC) had launched numerous attacks on the 15 kilometre climb, all of them unsuccessful – Menchov was capable of handling all the attempts to dislodge him from the gold jersey. Not only that, when he reached the summit, the Russian even had enough fuel left in the tank to take the fourth Vuelta stage win of this career. ?I?ve got more than half of this Tour of Spain wrapped up now.? Menchov commented afterwards, and his position as the Vuelta reaches its half way point is indeed strong. The Russian has a two minute and one second advantage over former leader Vladimir Efimkin (Caisse D?Epargne), whilst Cadel Evans (Predictor-Lotto) is in third place. Just as happened on the previous day, neither rider had even attempted to attack Menchov at Andorra. The stage was not without its own mini-controversy as Sastre accused stage nine winner Leonardo Piepoli, seventh on stage 10, of helping Menchov on the climb to Andorra. Sastre had launched at least four attacks, and on each occasion Piepoli – who broke away with Menchov on stage nine – had dragged the small group of race favourites up to his back wheel. ?It?s absolutely disgraceful that he helped the leader like that.? Sastre insisted. ?They?re not even on the same team.? ?Leonardo wasn?t going for Sastre when he responded to Carlos attacks.? Saunier Duval director Joxean Fernandez commented. ?It?s just the style he has of racing.? ?We didn?t talk, there was no discussion.? Menchov added. ?Leonardo always races like that. If people get dropped, they get dropped.? The other big story for stage 10 was Oscar Freire (Rabobank) failing to start. The triple stage winner and points leader is reportedly ill, although he was expected to pull out. After winning three stages, Freire?s absence will make it easier for the other sprinters to get a look in when racing resumes on Wednesday. First through, the riders have to get through a ?rest? day containing a 400 kilometre transfer south from Andorra – all of it by bus.